January 14 – February 14 we are having another “Bag of Books” sale: Buy $20 or more worth of used books and get 10% off your total price. All romance books off 20%! Don’t miss our Twelfth Night Sale on January 4, 5, and 6 at Star Cat Books. On Dec 22 and 23, Roberts in Bradford (go to the Post Office and follow the road down around back) is having “Make an Offer” days to help the needy have a good holiday. Don’t forget to go there and see what he has to make your holiday bright! From now through New Year’s, celebrate the holidays at STAR CAT BOOKS with savings! Buy $20 or more of used books, and with the bag of books you’ll save 10% on your purchase. We’ll throw in a special die-cast pin of a cat for you! We have a fundraiser going on Facebook, as well as the ability to donate here (note the DONATE button on the right side of our front page — there is also a text link if the button doesn’t work in your browser). The Facebook fundraiser is at this link — we appreciate anything you can contribute to keep us running in this economic clime, plus the current small business climate in our small town (several stores empty now) and a slow summer and fall. We are doing really well so far this holiday season, and that along with the fundraiser should put us into winter pretty well. We *will* be holding our usual winter auction of signed books to get us through the bleak Vermont season, but this year we’re doing it with a twist: instead of just Neil Gaiman books, we’ll be bringing you signed books from famous authors of all different genres. A little bit for EVERYONE! Watch this space for announcements as we get closer to running the auction. Come visit Gaby the store cat! Get your picture taken with SANTA! Sat. Dec. 1, 2:30pm-5:00pm at Star Cat Books. Are you naughty or nice? Dire straits w/ rent our landlord, until now, has let us pay as we can due to the uneven economy in this area. Now he wants ALL Dec 31 or he throws us out. We need $5.5k-please help keep an indie bkstore alive. Pop-Up Sale Fri & Sat! Don’t forget that our pop-up SALE is on Friday & Saturday, 11am-6pm. Savings in the entire store, plus a chance to win a new-condition Christmas-themed children’s book! STAR CAT BOOKS presents SMALL BUSINESS SATURDAY on Sat., November 24, 11am-6pm, the day after Black Friday. 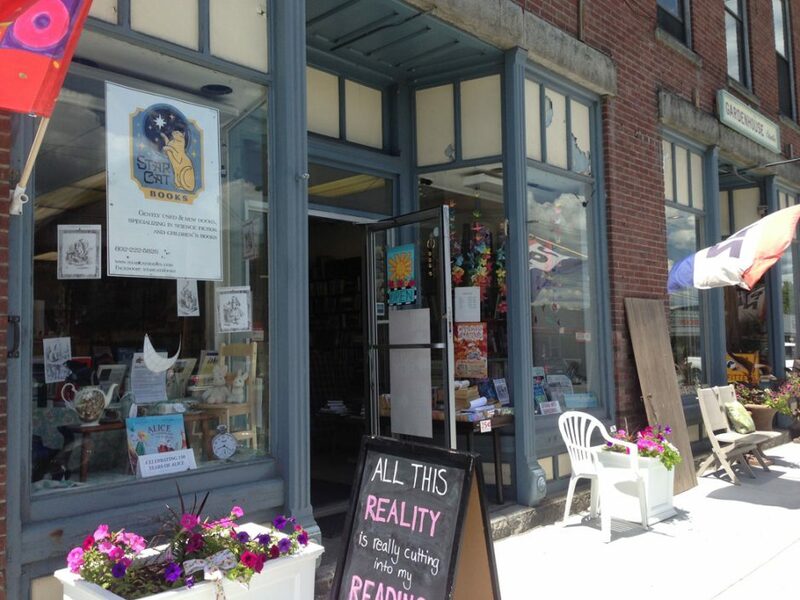 This is your big chance to support a LOCAL SMALL BUSINESS and an independent bookstore! We are one of 62 BEST INDEPENDENT BOOKSTORES IN THE WORLD as chosen by Atlas Obscura in the New York Times for 2018. Come see what the hoopla is all about! Come shop for the holidays early & support an indie bookstore in your locale.